Spring and autumn is a great time to hunt mushrooms. The only problem is that many mushrooms are poisonous. And to differ edible one from the one that will get you in a trouble can be not an easy task, especially for a beginner. But that’s not the case with Dryad’s saddle, which is very easy to identify and whose lookalikes could be not edible (due to tough texture), but not poisonous. And because it grows on fallen trees, it’s very easy to spot. You’ve probably seen it before while walking in the park or even in your backyard (like I did just one week ago). Hope you won’t miss it next time after reading this article. Disclaimer: Don’t eat mushroom, if you not 100% sure. I don’t take responsibility for your ability to identify dryad’s saddle correctly. Dryads saddle is a species of bracket fungus, which usually growth on dead wood, and more rarely on living trees all over the world (North America, Australia, Asia, and Europe). Cap is fan shaped up to 12 inches in diameter and up to 2 inches thick, white to beige in color with beige to brown scales, what makes it to look like pheasant’s back or hawk's wing. It has a short stem attached to the edge of a cap, rather than in the center. There is another mushroom that is known under hawks wing mushroom - Sarcodon imbricatus. But this fungus growth on ground under firs, has round cap, its stem is located in the center and it has teeth hemynophore instead of tubes. The underneath side of cap is all in pores or actually little tubes (you can see it clearly, if you cut the cap). Spores are formed in these tubes. Flesh of mushroom is white to off-white and don’t change a color when exposed to air. It also has distinct smell of watermelon rind or cucumber. Fun fact: The name dryad’s saddle came from Greek mythology. Greeks believed that tiny tree nymphs – dryads, were riding on this mushrooms. 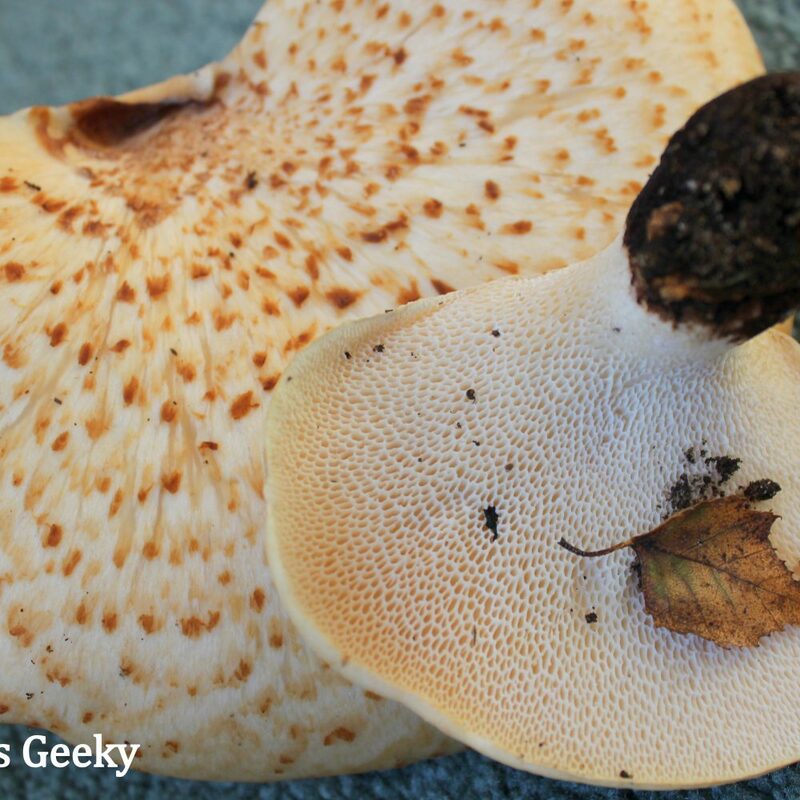 Dryad’s saddle toughens when get older, so pick only young fruit bodies. You should easily to slice it with your knife, or it means they’re too old to be eaten. This mushroom will reappear on the same place year after year until it consumes all wood it grows on. Most often Polyporus squamosus can be found in May and June, same time morels grow. But also can appear in autumn (September/October). The other Latin names Dryad’s saddle could be called (as it’s always very complicated about fungal taxonomy) are Polyporus septosporus and Cerioporus squamosus. Let’s clarify that there is no poisonous bracket mushrooms, but very few of them are edible, dew to very tough texture. So there is no dangerous look alike for Polyporus squamsus. But an important thing to remember is that Dryad saddle has pores (tubes) on the underneath side (hymenophore). If it has gills, like a portabella mushroom, it’s definitely better to stay away from it. Many people are asking about medicinal properties of this shelf mushroom, though they are yet to be discovered. There is no traditional medicinal use for Polyporus squamosus as for many other bracket mushrooms. You can cook Pheasantback mushroom in any way you do other mushrooms. You can dry them, use for stock or in the soup, deep fry or pan fry. But my favorite (and very easy) way is to sauté them with onions and herbs in white wine and sprinkled with Parmesan before serving. If you want to check the complete recipe. Dryad’s Saddle is an often overlooked mushroom, with a great taste, as to my pallets. This mushroom is also known under the names pheasant back and hawk’s tale mushroom or Latin name Polyporus squamosus. But if you landed on this page after looking for dryad’s saddle recipe ideas, you won’t be disappointed with this particular recipe, as it’s very easy and ends up deliciously. Butter (or other oil) – 2 Tb. sp. Grated Parmesan – 1 Tb. sp. Slice dryad’s saddle into thin strips. If stem part is not slicing easily, get rid of it. Add mushrooms and onions to melted butter and pan-fry on medium-high heat for a couple of minutes, until golden. Add salt, pepper and minced rosemary. Fry for another minute or two. Add wine and reduce heat to medium-low, sauté for another 3 to 5 minutes. Transfer to a serving plate and sprinkle with Parmesan. Enjoy! 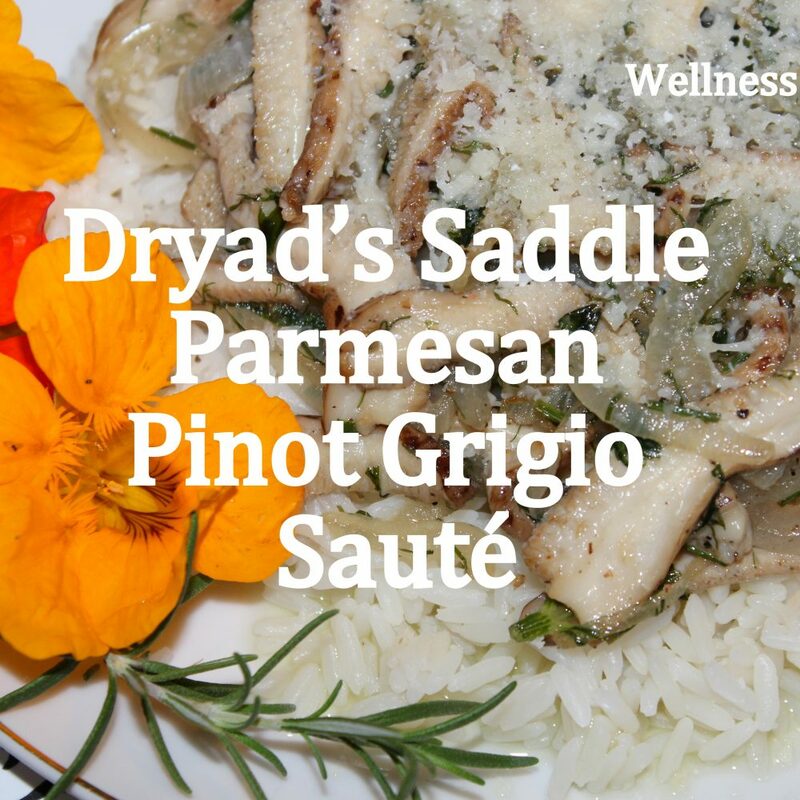 And what is your favorite recipe with Dryad’s saddle mushroom? Hope, after reading my article, you want miss this beautiful and delicious mushroom again. Discover how we can help you to skyrocket your health and productivity and transform you one idea at a time! Sign Up Below to Get Instant Access! Hi. My name is Julia (AKA Nerdy Green Mom). I Hold M.S. in Biological Sciences and Psychology and M.S. Nutritional Sciences degree with Diabetic Concentration from University of Michigan. Disclaimer: The information contained on this site is intended for educational purposes only and is not a substitute for advice, diagnosis, or treatment by a licensed physician. It is not meant to cover all possible precautions, drug interactions, circumstances, or adverse effects. You should seek prompt medical care for any health issues and consult your doctor before using alternative medicine or making a change to your regimen. Sign Up to our free newsletter instantly! Get our Healthy Life Tips! Wellness Geeky is a participant in the Amazon Services LLC Associates Program, an affiliate advertising program designed to provide a means for sites to earn advertising fees by advertising and linking to Amazon. com.